As a young engineer, my wife and I moved to the small town of Pampa, Texas, in the mid 80’s. There, we were introduced to real barbecue. 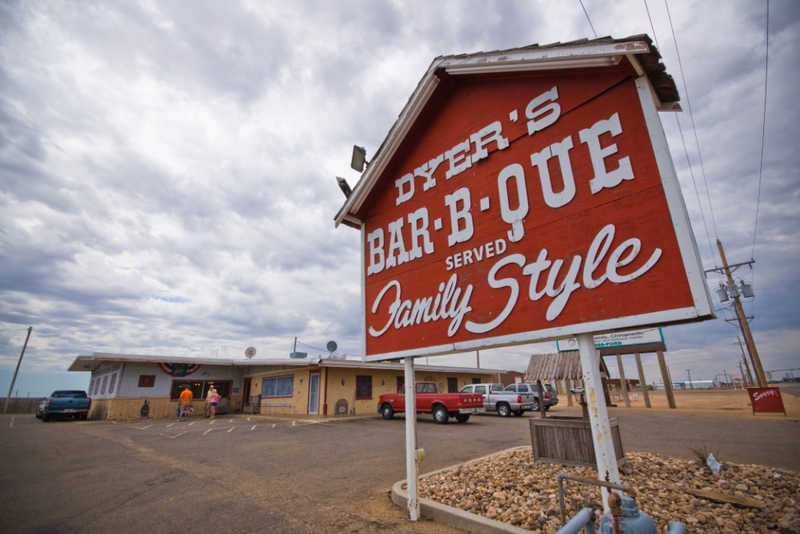 One of the places we came to treasure was Dyer’s Bar-B-Que, which opened on US 60 in 1967. They since opened another location 60 or so miles away in Amarillo. 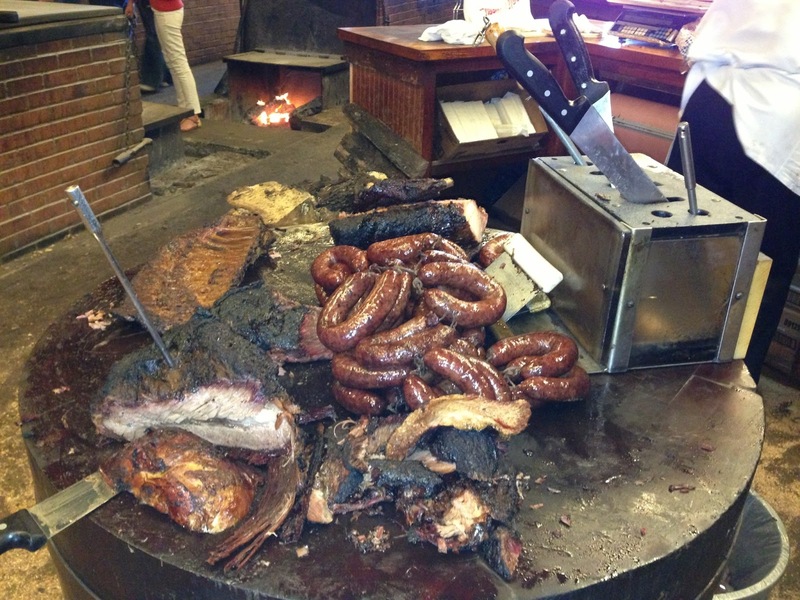 Dyer’s is where I discovered brisket and real sausage. And onion rings to die for. 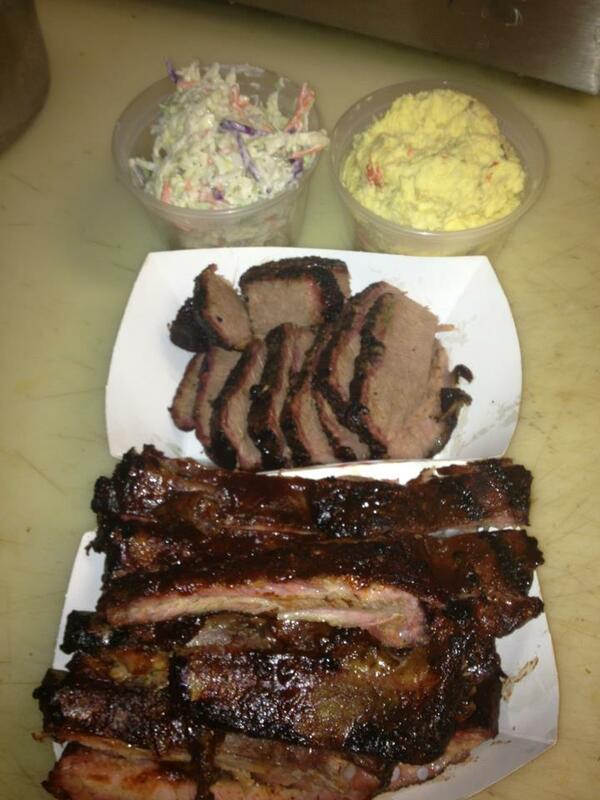 This week, it’s from Man Up Texas BBQ. Memorial Day is a day to remember those who died in the service of our country, and helped preserve the freedoms we hold so dear. 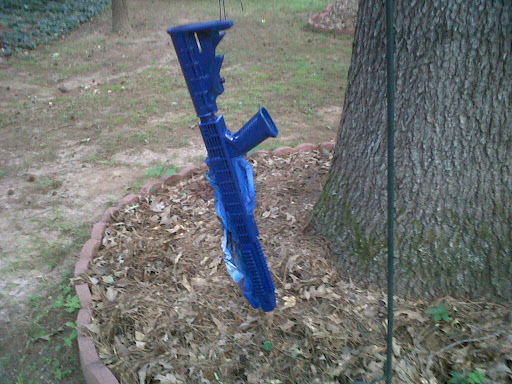 I lot of gun blogs I read have belittled those who see it as a day of barbecue. Forgive me. 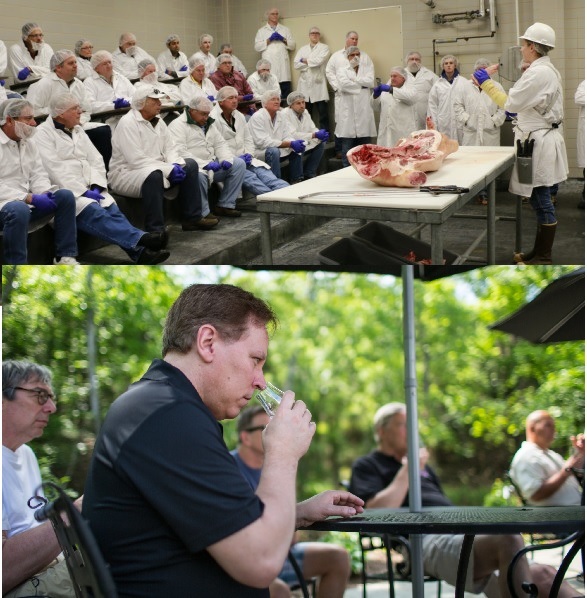 This is a barbecue blog. We’ll talk about guns directly. My Memorial Day started on Sunday, with the ceremonial Lighting of the Grills, accompanied by the National Anthem from my iPod courtesy of the US Army Band. Memorial Day is a great day for barbecue, because the meat usually goes on sale, and this year was no different. In fact, in the course of my shopping, buying a whole brisket and a slab of ribs, I almost made one of the most egregious errors in barbecue: buying too much meat for the grill. However, I was able to press my regular grill into service for the ribs, and all was saved. So, I marinated the brisket about 20 hours, and rubbed the ribs with some Cajun spices, salt, and sugar the night before. The smoke was all hickory, from my treasure trove of about 25 gallons of hickory chips left over from a carpentry project a buddy of mine had, 5 years ago. 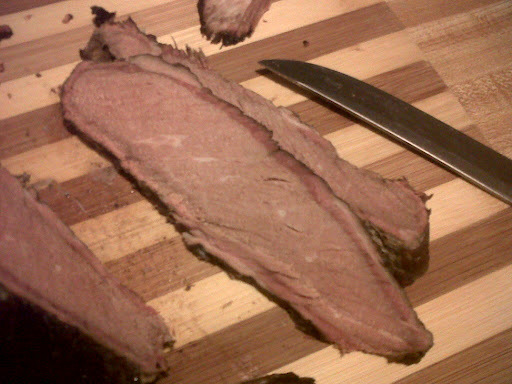 I cooked the brisket on the low end of the scale, since I had all day, and I fed damp chips about every 20 minutes. 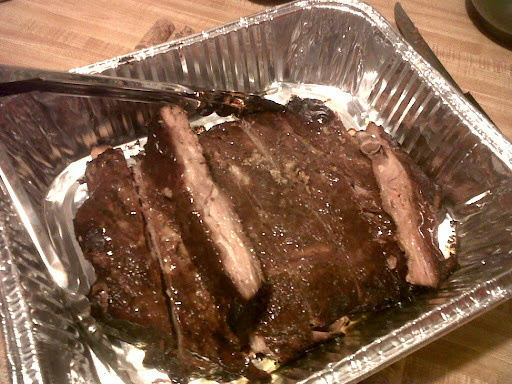 After about 4 hours of smoking, I wrapped it in heavy duty aluminum foil and cooked it the rest of the way covered. 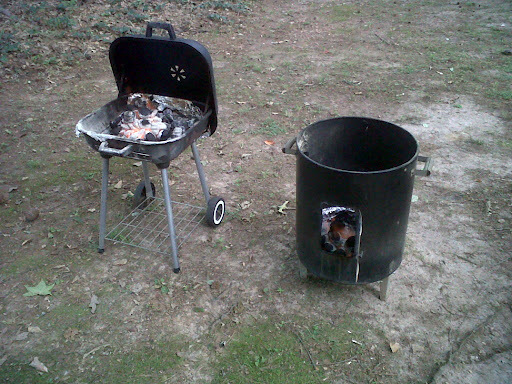 I also inserted a meat thermocouple at that time, and cooked it to 162 degrees F.
The ribs were cooked over the coals for ten minutes, turned and cooked another ten minutes, then I split the coals and basted the ribs the first time, and put them in between the two piles of coals to cook indirectly. 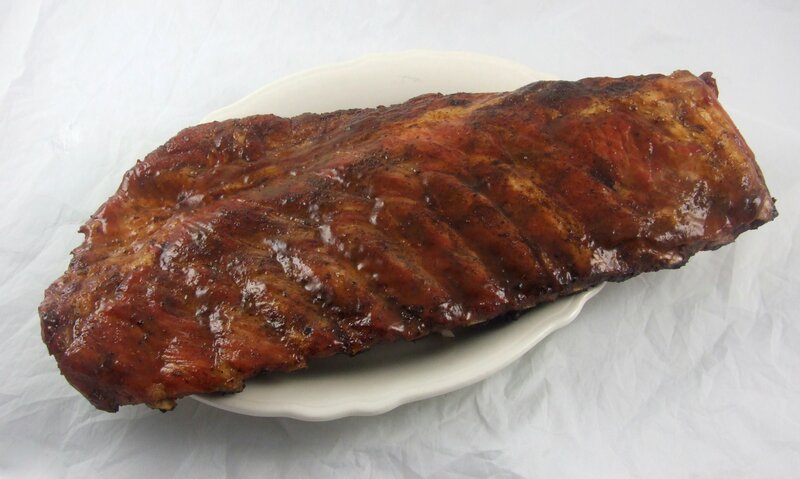 I like to cook my ribs wet, so after the first turn after basting, I put them on a piece of foil and basted them every 20 minutes with my Secret Sauce. I kept the fire low, just to the point where the pool of sauce around the ribs was bubbling just a little. 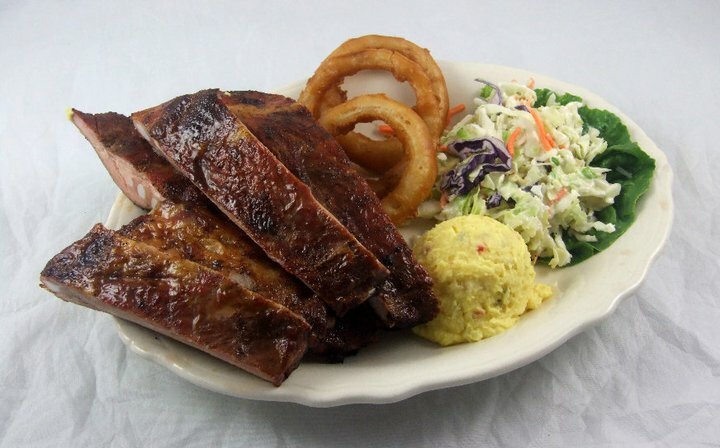 I cooked the ribs until I could wiggle a bone and pull it out. All in all it was probably 8 hours on the ribs, and 12 on the brisket. In between tending to the meat, I had plenty to do. First was painting the stock of my 10/22, to convert it from Steve Rogers to Captain America. The picture above is just after the second blue coat. Look for a full post in the near future on my other blog, Fill Yer Hands. 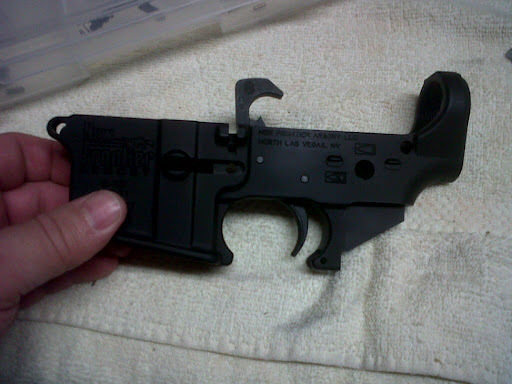 Second was installing the parts in the lower of my AR, Project Vera. This is all done, now I need to install buffer tube, stock, upper, and sights, and I’m done. Call it 30 percent at this point. Again, look for a full post at Fill Yer Hands. Memorial Day proper was spent at the Fundraising Match at the Creekside Firing Range in Cartersville, Georgia. Look for a full report on Fill Yer Hands there too. Finally, came the time to eat. I heated the meat in a 275 degree oven for about 45 minutes, and served them with homemade potato salad and baked beans. The results were worth the wait. These were probably the best ribs I have ever made, and the brisket was easily in the top quarter. And, since I took advantage of the sales, I have plenty of leftovers for the week. I observed the 30th anniversary of my 21st birthday on Friday, so I decided we would pick up some barbecue from a local shop, instead of making it myself. 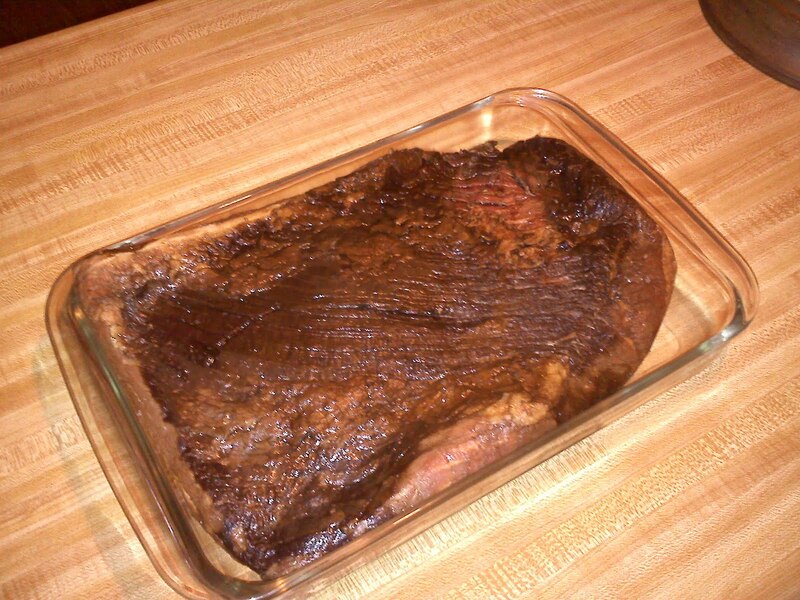 Having spent 7 and a half years living in Texas early in my career, I became quite enamored with barbecue brisket. It is truly one of my favorites to make and to eat. 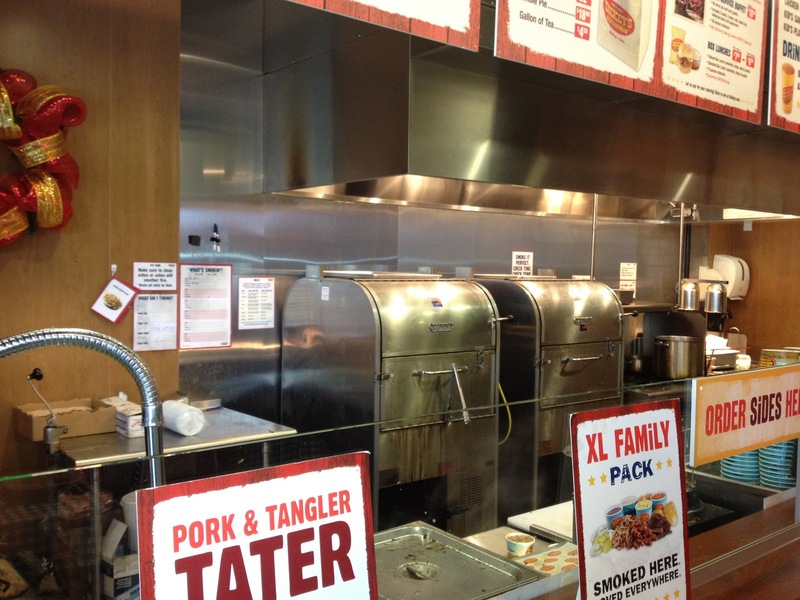 The trouble with brisket is that a lot of barbecue restaurants make it but few make it well. 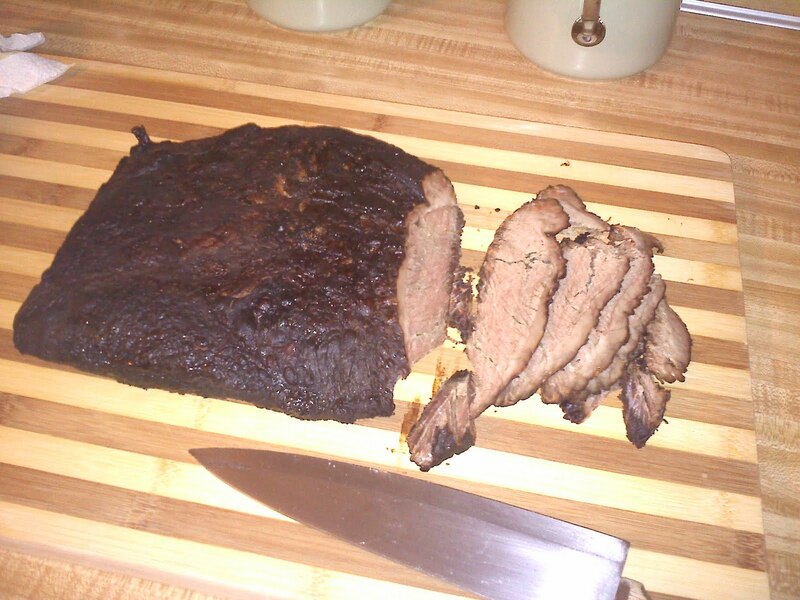 Good brisket should be smoky, tender, and flavorful, without being so overpowering that it loses its beef identity. So, you sometimes end up with roast beef on a bun, or with a smoke flavored mass. Strangely, one of the restaurants I’ve found that does it right is a small chain called Dickey’s which recently opened a shop near me. 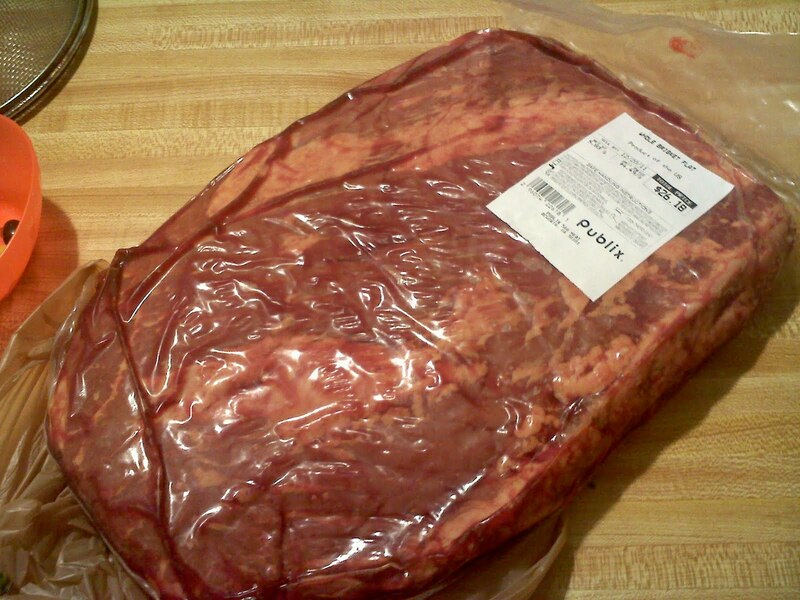 We brought home both chopped and sliced brisket. The chopped brisket can best be described as a meat cloud – very satisfying. Then, on Sunday, I made barbecued chicken again, this time starting with a whole cut chicken. The fire was a little too hot, though, and the breasts ended up with very hard bark on them, from the almost-burned layer of sauce. I was okay with that, as I could cut through it, but some others in the family seemed a little put off. The other pieces turned out well, probably because I knew they would burn, and I cooked them indirectly after the first turn. Next time, I will either cook it all that way, or go a little light on the sauce on the breasts. 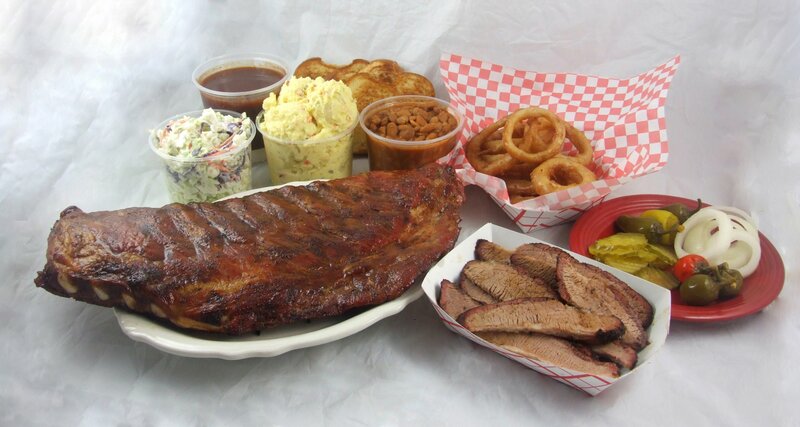 That’s one thing about barbecue, though – there’s always next time. This year for Thanksgiving we decided to do a brisket. What better way to make my first how-I-did-it post, than the Godfather of barbecue. I started with a 6 pound cut brisket from the local market. Admittedly, it was trimmed a little thin, and then cut off more fat than I would have liked. After marinating for 24 hours, I lit the charcoal at about 7 AM and let it come to a stable temperature. I used a Brinkman Smoke-n-Grill that I’ve had for about 10 years. It always has done me well. 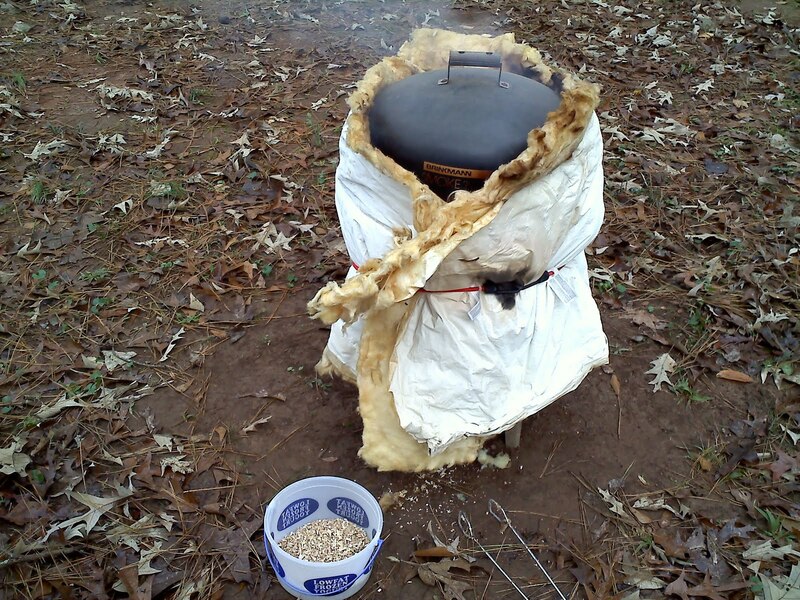 About 7 years ago I bought a standard insulation blanket for a water heater, and I use that in the cooler weather. The temperature the day before Thanksgiving was in the 50’s F, so this definitely counted. The meat went on the grill, fat up, at about 8 AM, and I immediately started smoking. I used a mixture of wet and dry shaved hickory. The shaved wood combined with the Dale’s marinade definitely gives the meat a sharper hickory flavor than chunks. 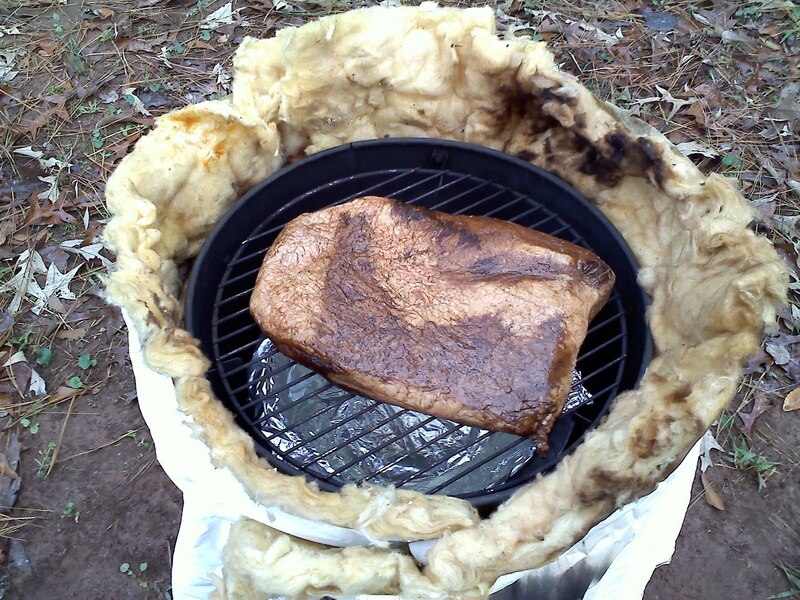 I had to add hickory about every 20 minutes for the first two hours, to maintain a dense smoke. I also added charcoal as needed to keep the needle on the temp gage at about 11 o’clock, which is where I find I get the best cook. 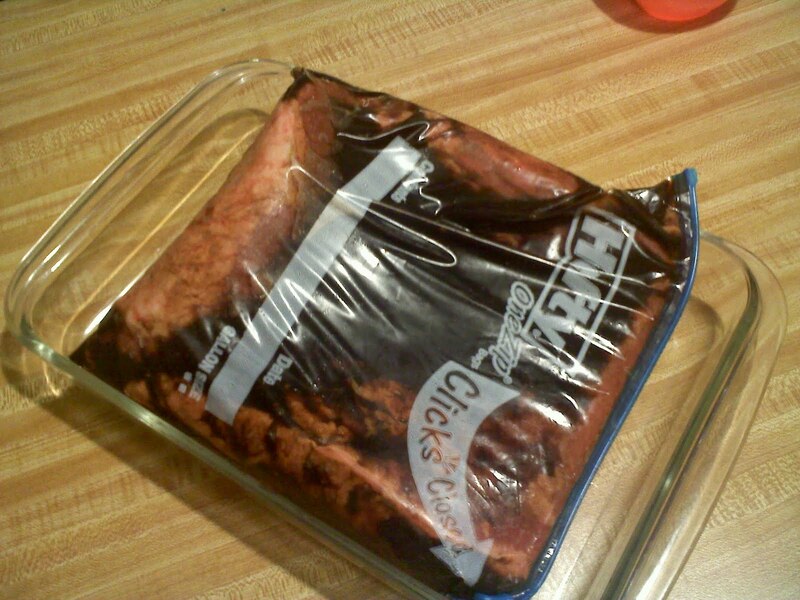 After about two hours, I wrapped the meat in heavy duty aluminum foil and inserted the thermometer. Since I was going to cook this about 11 to 12 hours regardless, the temperature reading wasn’t as important as it would be if this were, say, turkey or chicken. I cook it that long to break down all the connective tissue in the meat. All during the day, I kept the charcoal stoked to keep the needle between 10 and 11 o’clock. In all, I cooked it 11 hours. When the time came to take it off, I could pull off meat with my index finger and thumb very easily. Normally, I would let the meat rest about 15 minutes, then cut and serve. But because this was for Thanksgiving the next day, I let the meat cool a half hour covered at room temperature, then I refrigerated it overnight. 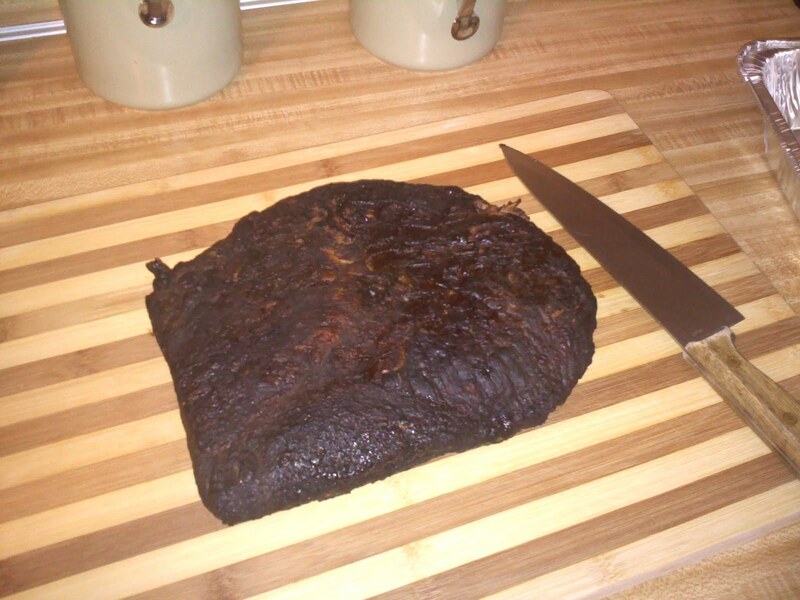 The next day, I sliced it, and heated it in the oven, covered, for about a half hour at 300 F.
All in all, it was a great brisket, and a great holiday. The wife and I were discussing Thanksgiving the other day, in between yelling at the football teams on TV. In the past we have done it all, entree-wise. Ham, turkey (roasted and smoked), roast beef. So this year, we decided on a new menu.